← Bill 32: Why is the Opposition in an Uproar over Billboards? It’s like running with scissors. It’s only a matter of time before someone gets hurt. On Oct 17, 2013, Duncan Campbell took over as interim CEO of Alberta Health Services, replacing Dr Chris Eagle who abruptly resigned with two years left to go on his five year employment contract. Mr Campbell eagerly took up the challenge of rebuilding AHS. Within a week he’d downsized the senior leadership team and was planning to finalize the remaining leadership changes and review the functions of the zones and province-wide services by Oct 31. He acknowledged the many parts of the organization had been in crisis mode and needed to turn to “calmer, safer waters”. He said clinical operations would be a priority. He was going to reinvest in “underserved” areas like children’s and adolescent’s mental health and hospital acquired infection. He wanted feedback and planned to set up a blog. He also set up a twitter account…(cue ominous music)…and when the $3 billion Edmonton super-lab crisis broke Mr Campbell tweeted that AHS would not seek bids until it engaged in further consultation with staff and physicians. Health Minister Horne quickly “corrected” Mr Campbell’s tweet saying the $3 billion RFP was proceeding and Mr Campbell was simply commenting about consulting (huh?). Two weeks later Mr Campbell was gone, well not gone, gone, but shuffled back to the CFO office to make room for two interim co-CEOs, Brenda Huband and Rick Trimp, who will hold the place together until the third CEO in three years climbs on board. This Keystone Kops story would be funny if it wasn’t so downright dangerous. The departure of a CEO unsettles any organization, even when the departure is a part of an orderly retirement/succession plan. It’s doubly unnerving when the CEO (Duckett) is replaced by the CEO (Eagle) who’s replaced by the interim CEO (Campbell) who’s replaced by two interim co-CEOs (Huband and Trimp) who are under the control of an Official Administrator (Cowell) who replaced the previous Official Administrator (Davidson) who replaced the board of directors (Stephen Lockwood) who were fired by the Health Minister (Horne) who replaced the previous health minister (Zwozdesky)—all in the space of three years! What if Minster Horne trips while running with scissors? Healthcare in Alberta is under siege. 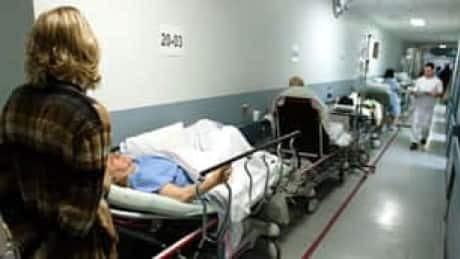 Emergency rooms are packed, patients are stacked up like cordwood in hospital corridors, surgical wait times exceed national standards, the privatization of home care is a bust, the “transformation” of the nursing profession is code for “cutbacks” and “de-skilling” and the Auditor General says infection prevention and control in our hospitals is below par. So what happens if Fred Horne refuses to put down those scissors and someone gets seriously hurt? Can they sue the government? The Supreme Court of Canada* held that law of negligence applies to governments just as it applies to individuals unless (1) the government is statutorily exempt from liability or (2) the governmental decision that resulted in harm or injury was a “policy” decision, not an “operational” one. In an example of delicious irony, we’re carried over the second hurdle by none other than former Health Minister, Mr Zwozdesky. He’s made it crystal clear that the Dept of Health is the strategic arm of the government, responsible for policy, strategic direction, global budgets and physician’s compensation and AHS is the delivery arm that puts it all into effect.”***In other words, decisions made by AHS are “operational” decisions which can be the basis of a lawsuit. The constant meddling by the Health Minister in the effective operation of AHS culminating with the precipitous demotion of Mr Duncan (just one month after he assumed the CEO role) is a key piece of evidence supporting the argument that the minister’s desire to organize, re-organize and re-re-organize AHS has seriously compromised AHS’s ability to deliver health services to Albertans. Albertans who have suffered or, heaven forbid, perished as a result of the minister’s interference will rise up and say that’s it, no more. And if they’re not prepared to wait until March 2016 to oust this pathetic government they’ll turn to lawyers for assistance. And when they win, and I’m wagering they will, the taxpayers will foot the bill. And guess what, it will be worth it to pry those scissors out of the health minister’s grasp. ***Hansard, Apr 13, 2011 p 645. ****The Government Organization Act and the Regional Health Authorities Act, Mandate Letter from Premier Redford. This entry was posted in Alberta Health Care, Politics and Government and tagged Alberta Health Services, Duncan Campbell, Horne, Interim CEO, Supreme Court of Canada, Zwozdesky. Bookmark the permalink. I think AHS should appoint Rob Ford as CEO. He is available, he wouldn’t have to make any decisions, Fred Horne does that, and he would be far more entertaining. Joan I love your suggestion that we replace Fred Horne with Rob Ford–at least Ford would be harmless (an embarrassment yes, but damaging, no). PS In the blog I said that Albertans who’ve suffered or perished will rise up and sue. Upon re-reading that it sounds like I’m saying those who’ve died will rise up from their graves like zombies. What I meant to say was their estates would be able to sue on their behalf–although we’re getting so bloody mad at Fred Horne and AHS that a zombie invasion isn’t out of the question. By now most people that read this blog are tired of my rants so I will just say that this all sounds almost unreal to me. The thought that underlining all of this is a failed political system we like to call democracy that is nothing else than a cover of a very bad process that is paralyzing us more and more. We see it at the Federal level with appaling degrees of secrecy and lack of integrity. We see it at our provincial level with mediocrity that I have only seen in the so called third world countries and now at municipal level with the Rob Ford soap opera that never ends. This is not accidental, this is a reality that unfortunately is slowly taking hold and the consequences are obvious. We are embarking on an experiment that could very well wipe us out of the map very quickly. Carlos, we never tire of your comments! One has to wonder how politicians become so odious. Surely some of them cared about the public interest when they first came into power. And that might be the problem–once they’ve tasted power they can’t let it go. Take Alison Redford (please). Her staff says (no doubt with her blessing) that all she needs is 50 plus 1% in this weekend’s leadership review to stay on. What leader worth their salt would stay on with that kind of support? I’m just hoping the delegates don’t vote to keep her because they don’t want to see the PCs ripped asunder by another leadership race at a time when the WR is becoming stronger than ever. All they’d be doing is delaying the inevitable. It promises to be an interesting weekend for the PCs and for the rest of us! There was a lot of angst among health workers in 2008 with all the confusion around the amalgamation of the health regions under one entity. Unfortunately that was only the beginning. Disruption and loss of stable leadership has become the new normal. It is essential that good decisions get made, and pronto, in the health care area. We cannot afford to be constantly looking around for a new “CEO”. That was part of the problem during the outbreak of H1N1 of 2009-10. The other factor was that former health minister Ron Liepert fired the very public health doctors who had the knowledge and experience in communicable disease outbreaks to respond to this crisis. One of the doctors let go was Dr. Karen Grimsrud. She happened to be one of the Co-chairs of the National Pandemic Influenza Committee at that time- right before the outbreak. One has to wonder how the roll-out of the vaccination program would have gone, and if health outcomes for some Albertans might have been more positive, had there been consistent and clear leadership at that time. You are right, Susan, playing political chess at the top administrative levels can cost people their health, and yes, even their lives. Fred’s response? The pathologists are one of the many stakeholder groups that have been consulted “on a regular basis for quite some time now”. Translation: Don’t care, buzz off. Thankyou Elaine, I had forgot about the H1N1 debacle! Local health boards demolished and replaced with a superboard. Privatization of hospital labs considered. I can’t remember when Redford became Premier, but if we count back 4 + 4 years from the next election (2016) that gives us 2008! Was that an election year as well? Was that the entrance to power or was it earlier? Interesting, seemingly benign, or better options……how would we know all these things would meld together so well today…..how one complements and supports the other. Then, let’s throw in the Edmonton Arena….Daryl Katz’s pet project that he managed to get city approval for, which is still waiting for provincial funding….the fact that he sits on the AIMCO board, hired by who? It is a crown corporation…which owns a building in the downtown area, and whose value is probably affected by construction of the arena….the current lease holder (Dynalife – owned 43% by Labcorp from the US) must vacate when their lease expires in 2017…this building will be torn down and an 85 story building will be built by AIMCO…..Dynalife is one of the top considerations for privatizing the hospital labs…..Daryl Katz was all over the news because he over-contributed to the PC party. ALL facts……my how they run together nicely…..
Take away local powers and centralize them, create a crown corporation that acts on behalf on the provincial government, privatize the hospital labs in the province – there’s no local powers to disagree anymore, so this can go province wide. As for the consultations that Fred Horne says are being done with stakeholders, for quite some time now…as a stakeholder, I can only assume he is talking about the information forums that Tammy Hofer and her side-kick of the day present to us. There is a presentation that is a half hour long (usually about 40-45 mins), where they TELL us what AHS is doing. After that we can ask questions, and we do, but the time is limited! These presentations (with questions) last about an hour. They are held onsite at one location, during the day, over a lunch or coffee break, or sometimes at random times. We only have 1/2 an hour for a lunch break and 15 minutes for coffee. If we are working, we can’t attend the whole thing, let alone ask questions! The last one that was held started at 1pm. No one goes for lunch or coffee at that time. We cannot leave the patient testing to attend! These sessions are teleconferenced, so other sites can listen in and ask questions via the phone at the end. However, we are testing patients specimens, and that is our primary focus. Usually, only one person in the whole Edmonton Zone gets a chance to ask a question over the phone. At the one hour mark, the phone goes dead, and the session is still going on, but we have no further access. I think they are doing this deliberately, to decrease the number of engaged people listening in and asking hard questions! I do not call this consultation!!!!!! By doing these presentations, they can say they have done due diligence, when in fact, they have not!!! Sorry for the length of this. There are sooooo many things people don’t know. The more we look into this, the more it involves and the more convoluted it gets. I never knew that an AHS superboard would lead to Hospital lab privatization, and then to an arena connection…. Lunelle, no need to apologise for the length of your comment. There are two things I’d like to pick up on. You mentioned the connections between so many PC high-rollers, who apparently take good care of each other. Heather Forsyth (WR) raised another example of this in the Legislature. She pointed out that AHS has re-hired the person Fred Horne fired when he fired the AHS board of directors. This person will be AHS’s chair of Audit and Finance. Forsyth said when this person held the same role just 4 months ago the Auditor General slammed AHS for approving $100 million in expense claims without a good process (the lack of process falls squarely on his shoulders). This person was also the chair of the Capital Region Health Authority when Ms Merali ran up over $300,000 in expense claims for butlers, Mercedes repairs and fine dining. She asked Horne why he wasn’t concerned about this. Horne replied that this person had a good reputation and he was appalled that Forsyth would besmirch his reputation. Apparently PC movers and shakers are like bad pennies, they keep coming back. Your comment about the so-called consultation is very disturbing. If Horne wants to be appalled about anything he should be appalled at AHS and himself for characterizing these drive-by meetings as consultations and then trumpeting to the world that they’ve consulted everyone. Tomorrow’s rally is very important. I’m glad that the unions will be there with you. I hope the 90 pathologists and medical professionals send representatives. Elaine has broadcast the event on the Whitemud Citizens for Public Health facebook page and the Soapbox blog post went viral (over 4000 hits) so that should help. All the very best to you and all your team mates Lunelle! I hope Fred Horne didn’t suffer whiplash on that about face!!! Unbelievable!!!!! Not only do the PC movers and shakers keep coming back, they seem to be multiplying!!!! I wonder how many more cronies will show up in AHS to fill positions vacated after Fred Horne fired the superboard……. Out information rally is very important!!! TY Elaine for posting this on your FB page!!!! Over 4000 hits on the Soapbox, Wow!!!! TY Susan!!!! It is very important that ALL Albertans really know how this PC government is operating on many issues, including healthcare, that will affect all of us! Susan, earlier, you commented on the 15 year contract that AHS is putting forward, and how crazy that is in the business world. I think I know why it is a 15 year contract. Dynalife, a “local” company, is one of the companies that expressed interest in this AHS deal to privatize the hospital labs. Their GRANDPARENT company, a pension plan in Ontario, REQUIRES a minimum 15 year contract for any of their investments. It almost looks tailor made. Borealis Infrastructure, one of the owners of Dynalife, is an investment arm of this Ontario pension plan. They provide the money, not lab expertise. One of the reasons that AHS and the PC government has stated for privatizing the hospital labs is that a superlab needs to be built and the expertise and knowledge is not here to do this, not in Alberta, not in Canada. (I’m paraphrasing, but that is the gist of it) Does Borealis Infrastructure have this expertise as an investment arm? The other owner of Dynalife, Labcorp might, but their expertise might lie in another area – billing?????? Another interesting point, when the hospital labs are privatized, the employees will again be stripped of their pensions. Ironic that a pension plan in Ontario would ultimately be the investor that strips our pensions. Wow Lunelle, you should be an investigative reporter. I went on to the Borealis Infrastructure website and clicked on the link that describes its investment approach. It said Borealis manages its investments to maximize cash income and capital returns over a long-term horizon and sits on the board “in order to assist management in achieving goals that are beneficial to the business and its shareholders”. And of course this is where we all came in–why is it better to outsource lab services to the private sector which (rightly) is focused on “goals that are beneficial to the business and its shareholders” instead of keeping lab services in the public sector where the goal is to ensure the health and wellbeing of the public without having to make a profit at the same time. You’re right that neither Dynalife nor Borealis appear to have the expertise to built the superlab so they’ll likely subcontract that out to an engineering and construction firm. Now wouldn’t that be a lucrative contract? I wonder whether the RFP specifies that the construction contract will have to be given to an Alberta based company. TY, That was my indirect, insinuated point! I am sure that this RFP contains NO specifics of construction. I believe the concern AHS and the PC government has is that a new superlab be built, and the successful bidder will assume all costs and responsibilities of construction of the new building. You had mentioned earlier that this RFP should contain something regarding bankruptcy, etc., of the successful bidding company. To my knowledge, there is nothing like that indicated in this RFP. Lunelle, thanks for the additional information on the RFP. I saw the pictures and comments posted on the Whitemud Citizens for Public Health facebook page. I was so pleased to see WCPH and Friends of Medicare in attendance. I wish I could have been there to lend my support to this worthy cause. We need to keep a spot light on this issue, because as they say, it’s not over until the fat lady sings and quite frankly an awful lot of attention is being focused on this RFP from both the patient safety perspective as well as the bone-headed contract perspective. Please stay in touch! It was Fantastic to have other interested groups at the rally to support this cause!!!! It was sad that on some stations, it didn’t even make the cut, they didn’t even air the story! One station did, and it was a very small clip, and they bungled the facts so bad that I don’t think the public still has any idea what is going on. I’m really beginning to wonder about the media and if they are being influenced in some way. Maybe next time, we should picket in front of their “house”. Lunelle: So what is it about the media that makes them report ad nauseum on Rob Ford but take a pass on a major issue like a $3 BILLION super-lab. We need to keep pushing this information out through our networks, both on-line and in person. I saw a facebook post on the Whitemud Citizens for Public Health asking whether there was a central place for information and updates. That was a good question and might be something people could pursue. I find writing letters to the editor sometimes helps, not because the letter gets published but because the press will turn its attention to an issue if enough people write in to complain about it. It also makes sense to send emails to Brian Mason (NDP) who first raised this in the Legislature and (I believe) is working with the 90 pathologists and other medical professionals who are deeply concerned about it. Here’s his email: edmonton.highlandsnorwood@assembly.ab.ca. The health critics for the other parties are also interested (although I know that they’re all swamped trying to keep up with the junk the Redford government is throwing at the every day). Here are their email addresses. Heather Forsyth (WR): calgary.fishcreek@assembly.ab.ca and David Swann (Lib) calgary.mountainview@assembly.ab.ca. We can’t figure out the media’s response either! We have taken note of all the Rob Ford coverage and we are left scratching our heads!!! We are continuing to spread this information in any way we can (online, emails, in person, via telephone, literature, and any other way we can think of) I saw the same FB post, and I totally agree! We will look into that too! We have been writing letters to the editor(s). We have also been in contact with all the opposition leaders and health critics, and written letters or emails to them and the PC leader and health minister. We are encouraging everyone we talk with to write editors and governmental leaders. Ty for posting those email addresses, especially for those that might see it here and want to send an email off!! We are far from done!!!!! Agreed! We are far from done. Lunelle, you’re an inspiration to us all!! !